These wonderful lamps with their unusual shades were probably made in the late 1950s - early 1960s. Each lamp has a circular base in the centre of which is a flat circular disc supporting three D shaped sections through which passes a square gilt metal branch arm. 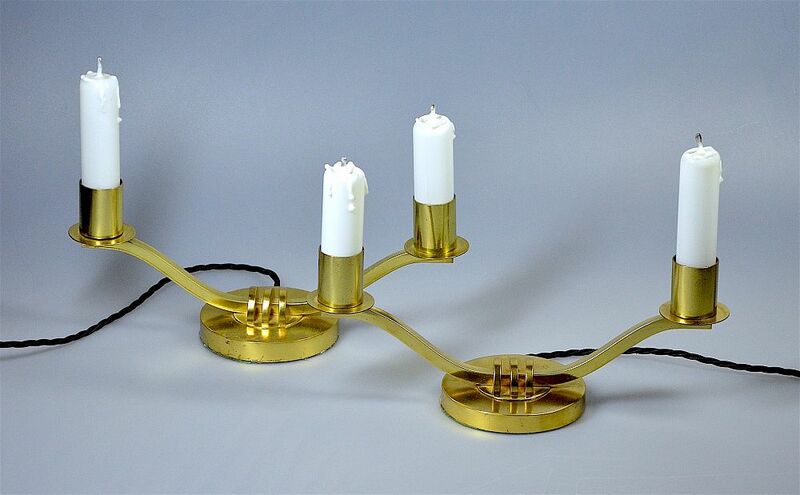 At the end of each branch arm is a round brass disc that supports the gilt metal tube that holds the bulb holder. The glass shades are in the style of a candle with a wick. The two shades are deliberately of different heights to give the impression of candles that have burnt at different rates.